Interstate 240 forms a southerly bypass of central Oklahoma City for I-40 west to El Reno and east to Shawnee. The freeway also provides connectivity with Interstate 44 leading southwest to Lawton and I-35 south to Dallas. I-240 also serves commuters to Tinker Air Force Base, Will Rogers World Airport (OKC) and the south suburbs including Moore. The Crossroads Renewal 240 interchange project started in June 2016 upgrades the full cloverleaf between I-240 and I-35 into a multi-level exchange. The four phase project runs through 2023. Completed in May 2017, Phase 1 work reconstructed the Southwest Expressway east from Santa Fe Avenue (Exit 3B) to past Shields Boulevard. The $12 million phase included interim ramp changes at Shields Boulevard. Phase 1A rebuilds the frontage road along the southwest quadrant of the exchange joining I-35 and I-240. It also permanently closed the on-ramp to I-240 east from Shields Boulevard and the southbound off-ramp from I-35 to SE 82nd Street. Started in June 2017, the $10.6 million project will be completed in summer 2018. Phase 1B, planned for fiscal year 2020, will redesign the remaining frontage roads. Phase 2 will construct the flyovers from I-35 north to I-240 west and from I-35 south to I-240 east. It will also replace the eastbound span for Interstate 240 over I-35. Phase 3 will complete work along Interstate 240 east between Shields Boulevard and Eastern Avenue, while Phase 4 upgrades the westbound direction along the same stretch. Phase 4 also includes work on a new bridge for I-240 over I-35. Phases 2 through 4 are scheduled for fiscal year 2021. The initial section of the Interstate 240 completed was the Southwest Expressway extending west from I-35 to the U.S. 62 freeway south to Newcastle. The route was posted as U.S. 62. Interstate 240 extended north over former I-440 along both the West Bypass and east along side U.S. 66 (Northeast Expressway) to form a three-quarter beltway around Oklahoma City. A section of Northeast Expressway, between Eastern and Lincoln Boulevards, was the first four-lane roadway to open in Oklahoma. 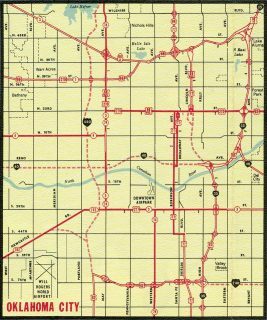 That roadway, opened in October 1950, was later designated as part of Interstate 440.2 I-440 formed the northern third of the Oklahoma City belt line to Interstate 35 near Lake Aluma. I-240 was designated along the southern loop, from I-40 west of Downtown Oklahoma City south and east back to I-40 beyond Tinker Air Force Base. 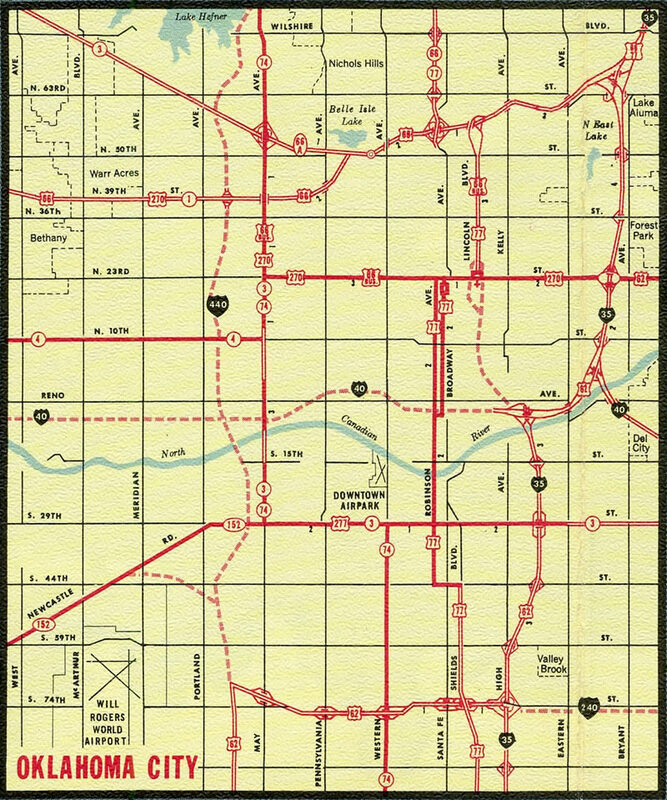 Interstates 240 and 440 encircling Oklahoma City – 1971 Official Oklahoma Highway Map. I-240 west from I-35 is the Southwest Expressway, while the freeway east to I-40 is the Southeast Expressway. Approved by AASHTO on June 17, 1975, I-440 was renumbered as Interstate 240, giving the entire loop a single designation. Exit numbers assigned to the freeway initially used the mileage for I-40. I-40 east approaching the exchange with then-Interstate 240 in 1978. Photo taken by Bill Manning. 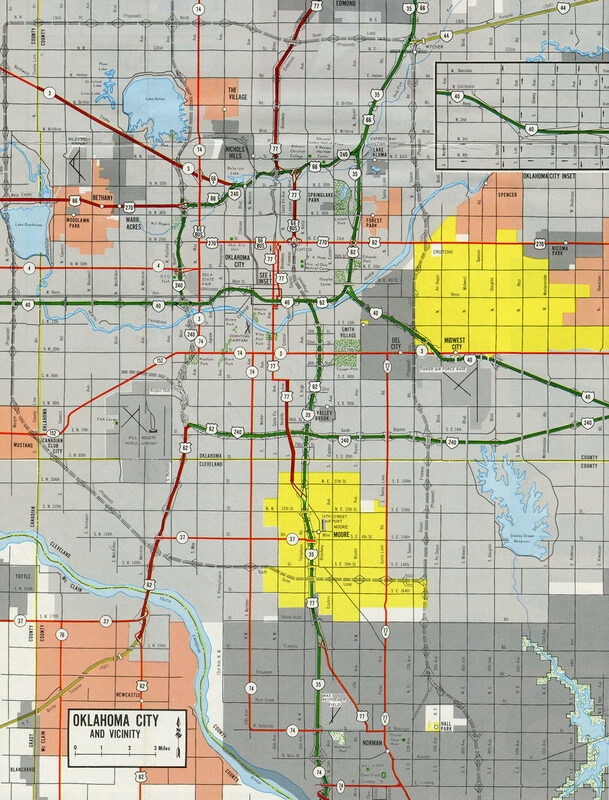 Further changes for Interstate 240 were made, with Interstate 44 overtaking both the original I-440 section, and the north-south leg of I-240 as part of its extension from the Turner Turnpike near Edmond south to Lawton and Wichita Falls, Texas. AASHTO approved the designation changes on June 28, 1982. Interstates 40 and 240 converge 13 miles east of Downtown Oklahoma City in a rural area. The final confirming marker stands east of Anderson Road. Photo taken 05/06/12. Traffic along I-240 & SH 3 east narrows into a single lane ramp onto Interstate 40 & U.S. 270 east ahead of Shawnee. There are no signs indicating the end point. Photo taken 05/06/12. One mile ahead of the split with I-240 on Interstate 40-U.S. 270 & Oklahoma 3 west at the parclo B2 interchange (Exit 166) with Choctaw Road. Photo taken by Eric Stuve (03/23/14). Interstate 240 provides part of a direct route to I-35 south to Dallas and I-44 southwest to Lawton. Photo taken by Eric Stuve (03/23/14). I-40 & U.S. 270 west enters the wye interchange (Exit 165) with Interstate 240 & SH 3 west to south Oklahoma City and Will Rogers World Airport (OKC). Photo taken by Eric Stuve (03/23/14). Button copy signs formerly posted on I-40 west at Choctaw Road (Exit 166). Clearview font based signs were installed along this stretch of Interstate 40 by 2011. Photo taken 10/20/03. 2011 sign replacements moved the reference to SH 3, which overlaps with the entirety of I-240 west, to a point east of Choctaw Road. This sign was otherwise replaced. Photo taken 10/20/03. Interstate 240 is the last branch route of I-40 for the remaining 1,227 miles west to Barstow, California. Photo taken 10/20/03. Westbound Interstate 240-U.S. 62 & Oklahoma 3 meet South May Avenue (Exit 1B) at a diamond interchange, one mile ahead of Interstate 44. Photo taken 05/06/12. 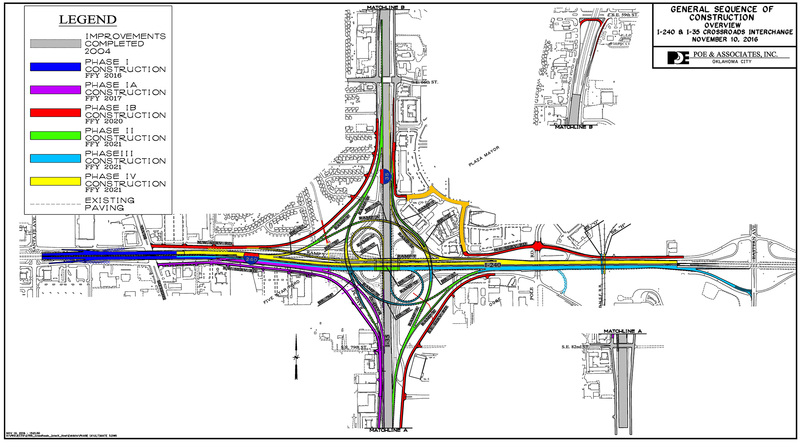 Advancing west with four lanes, traffic along Interstate 240 generally defaults onto I-44 leading north to both SH 152 (Airport Road) and the west side of Oklahoma City. Back to back lane drops follow for the continuation of U.S. 62 southwest along I-44 toward Newcastle and SW 59th Street. Photo taken 05/06/12. An end shield for Interstate 240 stands within the trumpet interchange (Exit 1A) joining the two freeways. Photo taken 05/06/12. Interstate 240 west curves north to merge onto the left-hand side of I-44 eastbound. 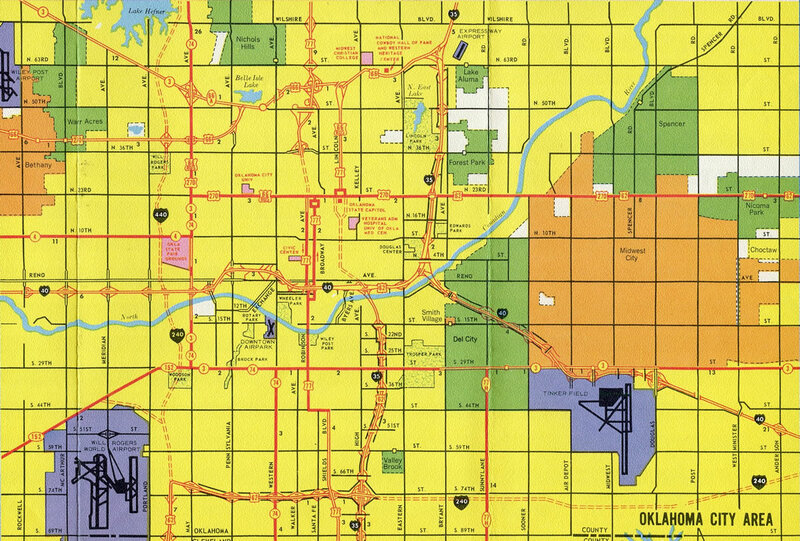 Oklahoma 3 overlaps with I-44 north to the Northwest Expressway. 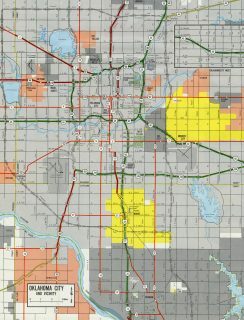 Westbound I-44 travels 77 miles southwest to Lawton, mostly along the tolled H.E. Bailey Turnpike. Photo taken 05/06/12. Exit 116A separates from I-240 just ahead of I-44 east for SW 59th Street. SW 54th Street extends west from 59th Street as an alternate to SH 152 (Airport Road) west to Will Rogers World Airport (OKC). Photo taken 10/20/03. A ground level sign posted within the folded diamond interchange (Exit 114) at SW 74th Street provides short notice for Exit 115 to Interstate 240, U.S. 62 and Oklahoma 3 east. I-240 forms a commercial corridor east to Interstate 35, and a through route for motorists headed 182 miles east to Fort Smith, Arkansas via I-40. Photo taken 05/06/12. An auxiliary lane formed from SW 74th Street parts ways with I-44 east at Exit 115. U.S. 62 accompanies Interstate 240 east to I-35 north through Oklahoma City. Photo taken 05/06/12. Replaced button copy guide signs at the split of U.S. 62 and Interstate 44 east by Will Rogers World Airport (OKC). Photo taken by Eric Stuve (09/11/02). Celebrate the Interstate: America’s Interstate Highway System Turns 50! http://www.okladot.state.ok.us/okinterstate50/ Oklahoma Department of Transportation, web site. “Interstate Highway System Celebrates Silver Anniversary.” The Daily Oklahoman, November 15, 1981. Darrell Brunson, email: “The H.E. Bailey Turnpike & I-44 at OKC,” August 13, 2017. Page updated August 22, 2017.